MacOdrum Library - Carleton's Institutional Repository: Can community-based initiatives address the conundrum of improving household food access while supporting local smallholder farmer livelihoods? Can community-based initiatives address the conundrum of improving household food access while supporting local smallholder farmer livelihoods? Community food security (CFS) is widely defined as "a situation in which all community residents obtain a safe, culturally acceptable, nutritionally adequate diet through a sustainable food system that maximizes community self-reliance and social justice" (Hamm and Bellows 2003, 37). The CFS concept has also been widely adopted in Canada by community-based organizations, including public health units across Ontario, in their efforts to tackle household-level food insecurity while also supporting local efforts to (re)build sustainable agriculture. This chapter explores this conundrum at the heart of CFS: Can community-based initiatives help address household food insecurity and support fair livelihoods for local smallholder farmers? 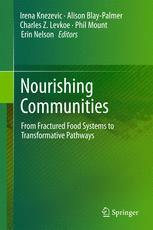 Our research shows that responding to both sets of needs through community-based initiatives is possible, and could be seen as an important step towards broader food system transformation based on a more cooperative approach to economic relations. However, the evidence also shows that these initiatives can prove challenging to organize and administer, and should not be seen as a substitute for income support provided by the state to the food insecure.